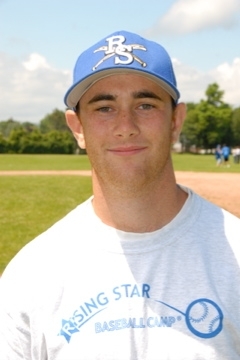 Coach Claude Balliet attended the Rising Star Baseball Camp during summers 1999-2001. As a catcher at New Rochelle HS in 2002-2005, he demonstrated leadership, work ethic, and versatility as a player. For his efforts, he was selected as All-League HM in 2005 and won the NRHS Leadership Award in 2005. In addition, Coach Balliet came back as an assistant coach at NRHS in 2006. He also is the head baseball coach for the Westchester Baseball Academy's 18U Travel Team. At camp, Coach Balliet works with the catchers on proper fundamentals. In particular, he implements drills to build competency with framing, blocking, throwing out prospective base stealers, and fielding bunts. Famous for hitting towering catcher pop ups, Coach Balliet enjoys focusing on many finer aspects of catching, such as communication with umpires, pitchers, and defensive player alignment. Coach Balliet has been coaching at camp since the summer of 2005. Since 2012, he has served as the field director on the Triple and Double A diamonds.